The following reminiscences are courtesy of Jesse Bookhardt. Jesse’s been a long-time follower of Vanishing South Georgia and has shared numerous memories of life and places of mid-20th-century South Georgia with me over the past few years. I was born just after the Great Depression was more or less over; yet, I remember stories that my parents told about the times. They both referred to the era as “Hoover Days.” Republican President Hoover may not have totally caused it, but most people gave him the blame. In our house there were two Americans who were despised, Tecumseh Sherman and Herbert Hoover. Anyway, times were hard all over the country. Hundreds of thousands were out of work and many thousands roamed the country looking for jobs and support. Whole families were destitute and homeless. John Steinbeck’s “Grapes of Wrath” is recommended to those who have never read it, since it depicts the hardships well. Now to us that kind of humor is little appreciated but I never remember my dad telling that joke when others who had lived through “Hoover Days” didn’t laugh vigorously. They definitely related to the message of the joke. They often stomped their brogans on the ground and slapped their overalls with their hats, then followed with their own experiences from the Great Depression. Very few of us have been forced to forage for our breakfast in a persimmon tree like a possum, though we have recently suffered and are still, to a degree, suffering from the deepest recession since those dark difficult days. 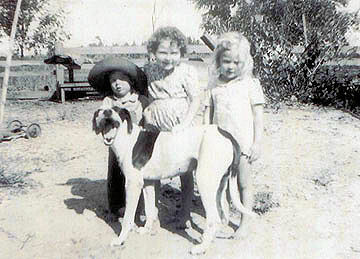 “Blackeye” with Jesse, Sara Jo, and Daniela, 1940s. Those days were never far from our family. Everything was referenced to the “Depression.” My dad moved to Jeff Davis County in 1938 from Florida where he had been since about 1928. 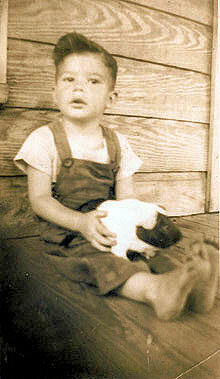 He came during the Great Depression as a tobacco barn hand who stayed up all night curing tobacco in a wood fired barn. He later grew tobacco as a share cropper. Before coming to Georgia, in Florida he did any kind of job he could to make ends meets. He spent much time fishing and selling his catch to fish markets and anyone else who would buy. In his backyard, he smoked what he couldn’t sell to preserve it for his family and for sale on another day. He and many others of the time, ate simple foods that sometimes included Cabbage Palm. For many in the South, the Depression lasted longer than it did in other sections of the country. Once Daddy told of having to go hunting quail with only a few shotgun shells. He could not find any quail and finally decided to harvest some robins. So he found a large flock on some Gallberry bushes and shot into them. He used his shells but had enough birds for the family for supper. He said that they didn’t taste like quail or dove but were mighty good. I have always thought that the Great Depression should have been called the Terrible Depression. 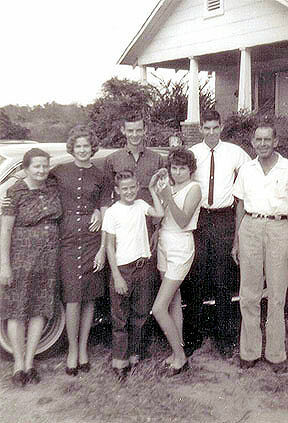 Bookhardt Family at the Clarence Walker Homestead, Jeff Davis County, Georgia, 1962. Back: Left to Right, Eva Lou, June, John, Jesse, and Edward Lee, Sr. The photos are compliments of Jesse Bookhardt, and can also be viewed at the North Carolina State Historic Preservation Office’s Tobacco Barns page. Jesse wrote a nice memory of tobacco farming for them entitled “South Georgia Tobacco Patch”.